Many land managers and large scale landowners require regular management of rabbits on their ground. This could be to protect rare species of wild flower, to protect a certain soil formation or habitat or merely to prevent damage to structures such as roads, walls and buildings. Assured Environmental Services can provide a management plan to combat rabbit numbers. These include the use of gassing compounds by our technicians who are trained to the new City & Guilds required level. Linked in with gassing which is usually the most cost effective method, we can also carry out some more traditional means of control. 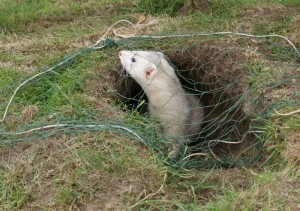 This may include night shooting, flushing of surface living rabbits with a dog, box trapping or drop trapping of rabbits and in some areas of high public access or organic farmland, use of ferrets and nets can be incredibly effective. Staff at Assured Environmental Services are used to working in rural and rugged environments. When we carry out rabbit control we do emphasise the word control as the rabbit is so mobile and resourceful, total control is never an option but we do manage to severely reduce rabbit numbers to a reasonable level.